“Audi to quit Le Mans and Sportscar Racing at the end of the 2016 season” was the headline that shocked the racing community when the news broken last month by Sport Auto’s Chief Editor, Marcus Schurig, in Germany. The impact will be felt far and wide as many in the business have depended on the huge budgets committed by the German giant, either directly or indirectly, not to mention the Départment of La Sarthe. 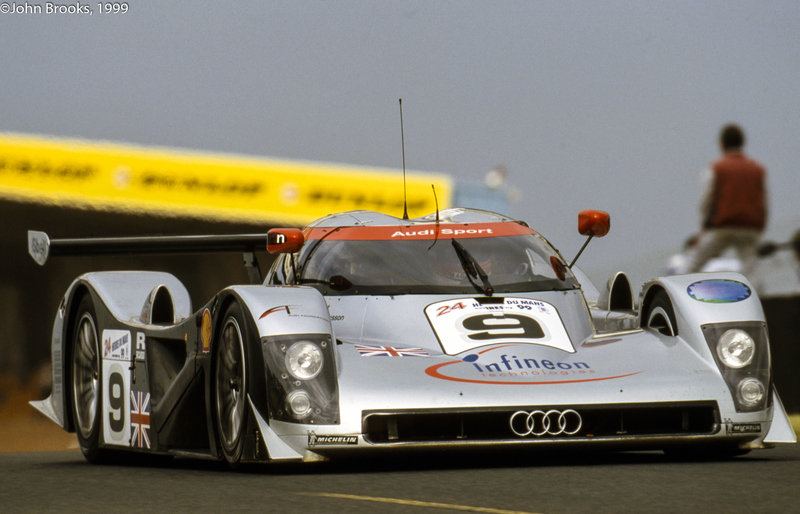 The story of the 18 seasons at the top of the endurance racing tree will come to fill the history books but perhaps now it is time to have a brief look at the racer that created the Le Mans legend, the Audi R8. But first we should examine at how this journey started. Like all epic tales there was a prologue. 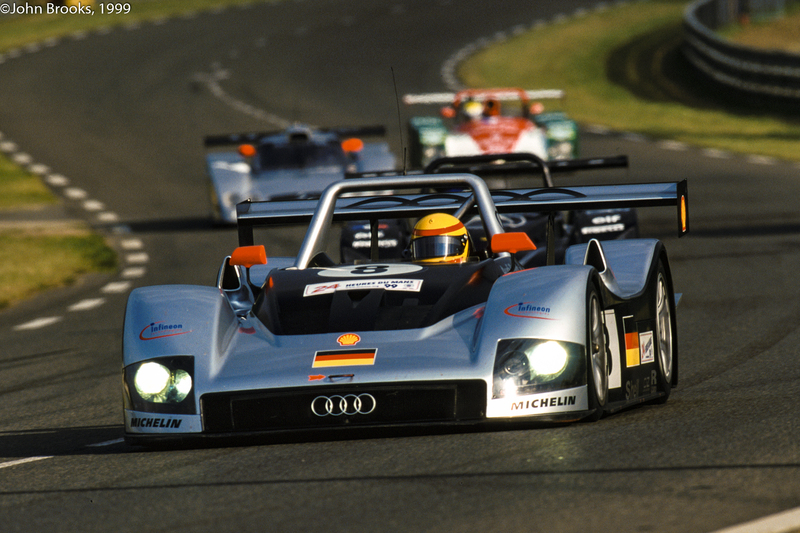 Audi arrived at Le Mans in 1999 with not one, but two diﬀerent race cars, one open, one closed, the rules of the time allowed for radically diﬀerent solutions. The Audi R8R’s chassis was designed by Dallara and built by ATR, while Fondmetal assisted the German factory with the aerodynamics. 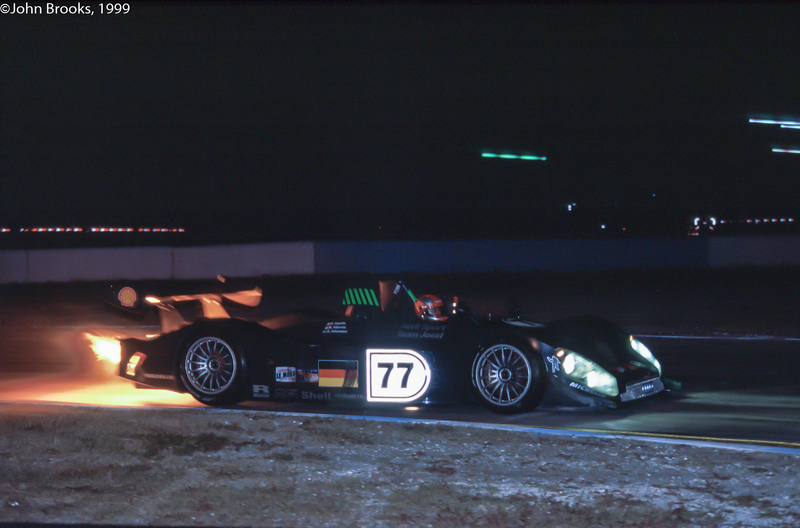 The R8R made its debut in March 1999 at the 12 Hours of Sebring. 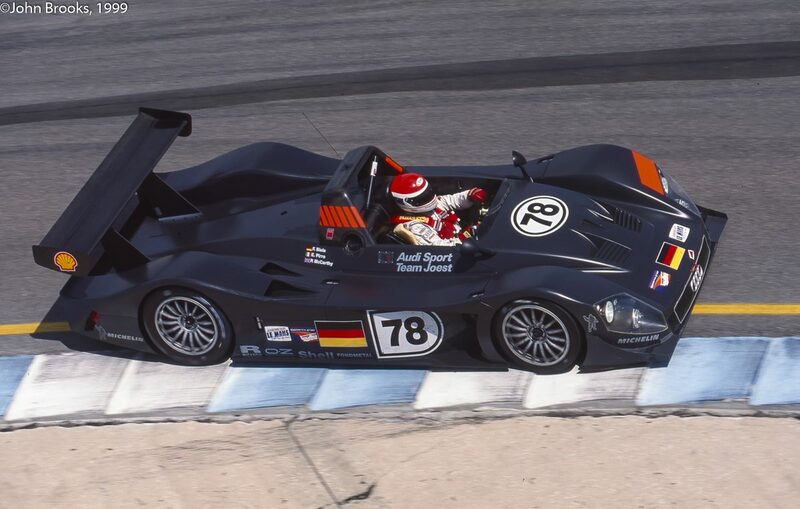 Two of the open prototypes were entered with the operation run by Joest Racing, four time winners at Le Mans, 84-85 with a Porsche 956 and 96-97 with the Joest Porsche. 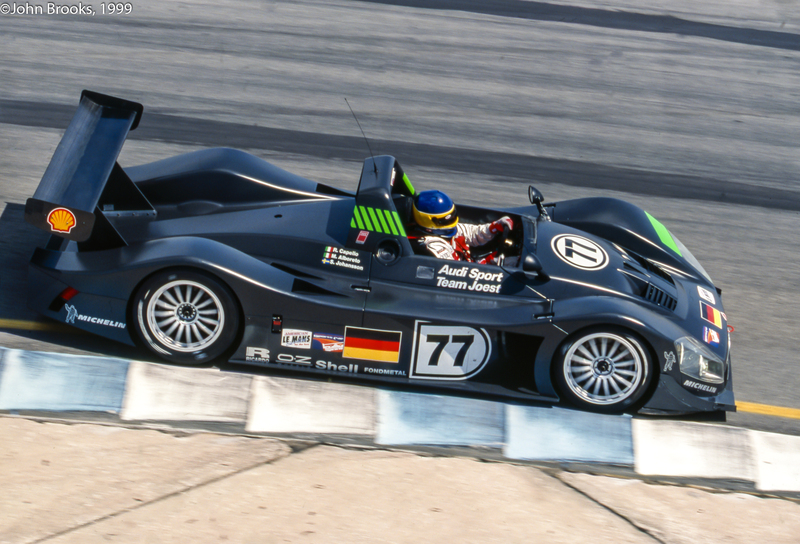 #77 had former Ferrari Grand Prix stars , Michele Alboreto and Stefan Johansson on driving duties. 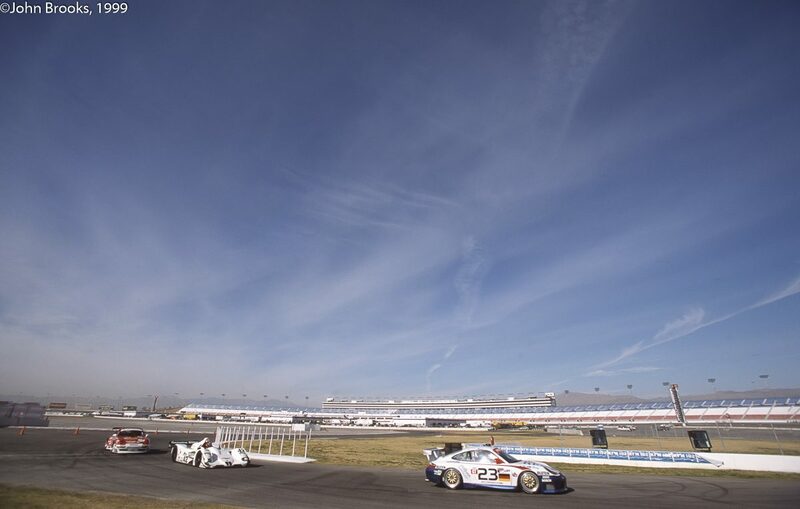 This pair of former winners at Le Mans were joined in Florida by Dindo Capello, a multiple Italian Touring Car Champion with both VW and Audi. #78 had Frank Biela, Emanuele Pirro and Perry McCarthy in the driver’s seat. Pirro and McCarthy were both ex-Formula One men and Biela, another long time champion driver for Audi in DTM and BTCC. 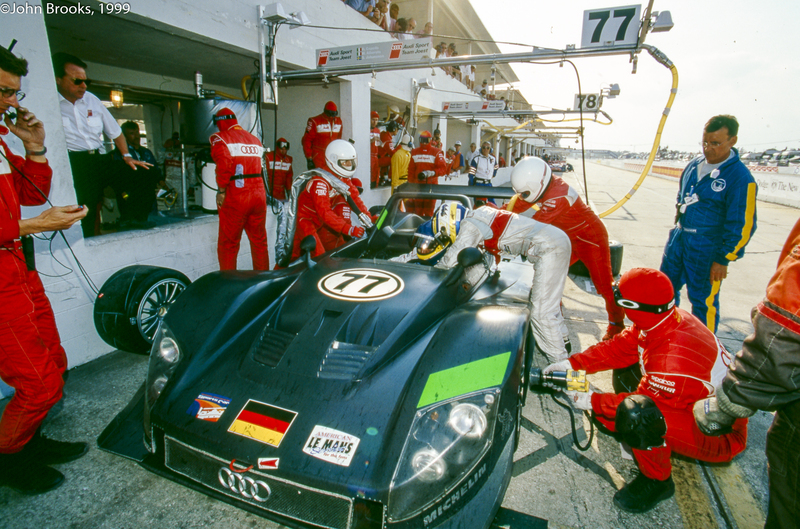 The 12 Hours of Sebring is widely regarded as the toughest of all endurance sportscar events and Audi found out the hard way, making all manner of adjustments to the car that had not been necessary in pre-season testing. Audi struggled in Qualifying managing only 11th and 12th places, over 4 seconds down on the pole setting BMW. The ride height caused handling issues that could not be fixed at the track, it was going to be a long race. Race day was kinder to Audi who got both cars to the finish, in third and fifth places, as others failed. 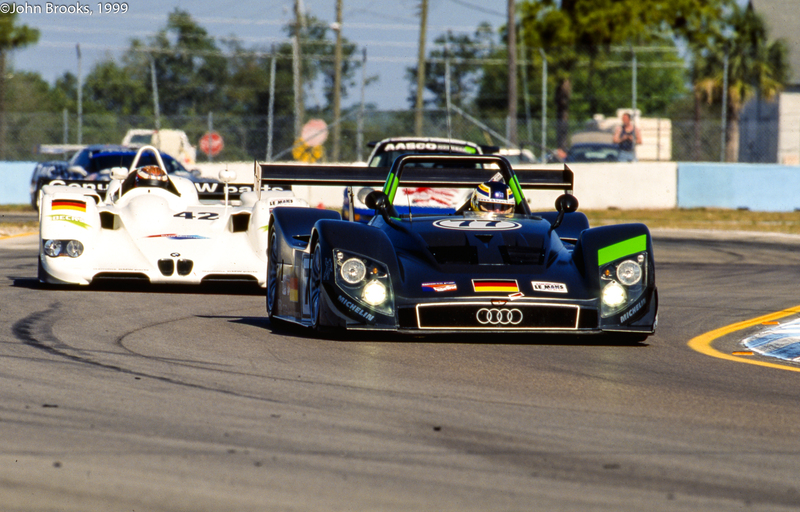 A podium for Alboreto, Johansson and Capello, albeit 3 laps down on the winning BMW, would be the first of many for Audi in North America, it was a solid start to the project. 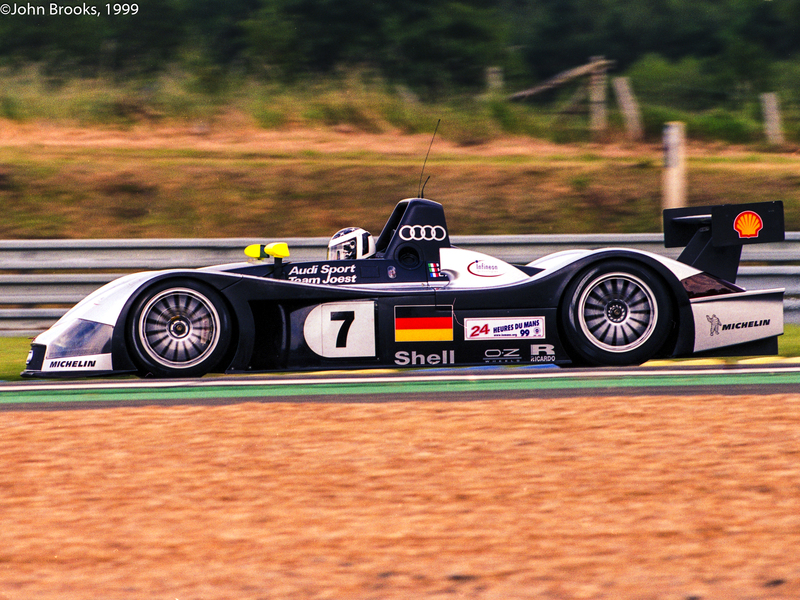 The next appearance for Audi was in early May in Pre-Qualifying for the Le Mans 24 Hours. 53 cars chased the 46 spots on the grid, those who could not beat the clock would be eliminated, unthinkable for a factory-backed team. The sleek Audi R8C pair made their first competitive appearance. Designed by Tony Southgate, engineered by Peter Elleray and sharing the same engine (3.6 litre V8 with twin turbos) and rear drive train as the R8R. The handsome coupé was seriously underdeveloped having been commissioned too late (the project only started in the previous September) with the second car only just completed before Pre-Qualifying. The driver line up was certainly experienced with #9 crewed by former winners, Stefan Johansson and Stéphane Ortelli who were supported by Christian Abt, a late call up after Yvan Muller withdrew from the Audi squad. #10 was an all English affair with James Weaver and 1988 winner Andy Wallace sharing the wheel with Perry McCarthy, the original Top Gear ‘Stig’. The R8R pair qualified for the race with relative ease, not far off the outright pace of the leading Toyotas and BMWs with the Panoz Roadster S also showing a good turn of speed. Both R8Cs struggled to get into the race, Wallace having his door sealed up with tank tape to prevent it flying off once more into the French countryside. When the Chequered Flag was finally waved both were in but it had been a nervous time in the Audi Sport UK pit. Five weeks later the circus reconvened at Le Mans, this time it would be for real………come back later for the balance of the tale. 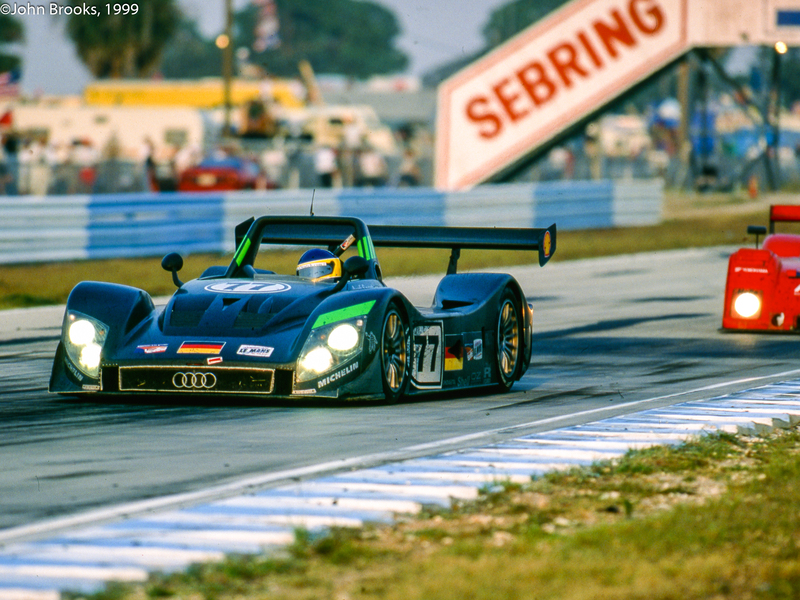 This entry was posted in Nostalgia, Notes from the Cellar and tagged 12 Hours of Sebring, Andy Wallace, Audi R8C, Audi R8R, Christian Abt, Dindo Capello, Dr. Wolfgang Ullrich, Emanuele Pirro, Frank Biela, James Weaver, Joest Racing, Michele Alboreto, Perry McCarthy, Stefan Johansson, Stéphane Ortelli on December 13, 2016 by John Brooks. In the run up to the 60th Anniversary 12 Hours of Sebring I amassed a few recollections from those who had been at previous events………..Ken Breslauer has graciously allowed me to publish these accounts here on DDC……………enjoy. You can still order a souvenir program from this year’s 12 hour classic. Fans have told us its the best Sebring program ever- 200 pages filled with historical photos and features. $20 + $6 shipping. You can order by calling Toni at 800-626-7223. 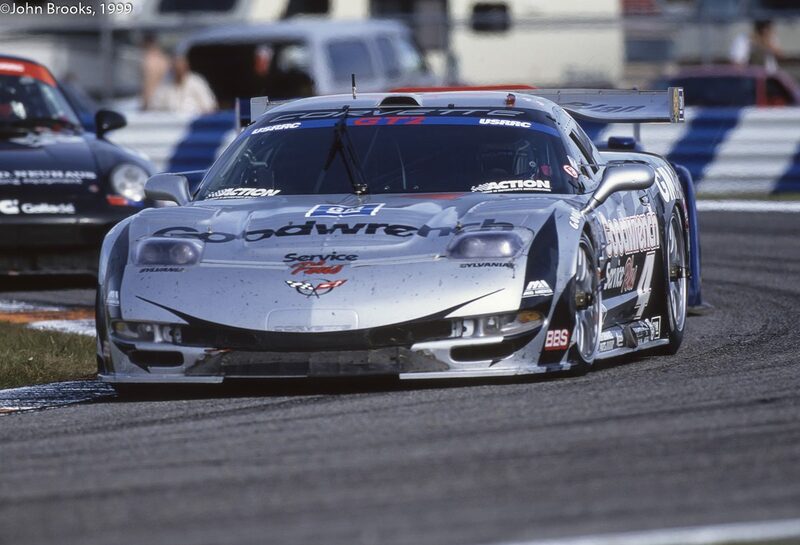 In November 2000, we were testing the Corvette GT1 cars on the full Sebring track and it was the first time Dale Earnhardt and Dale Jr. had been in the cars. 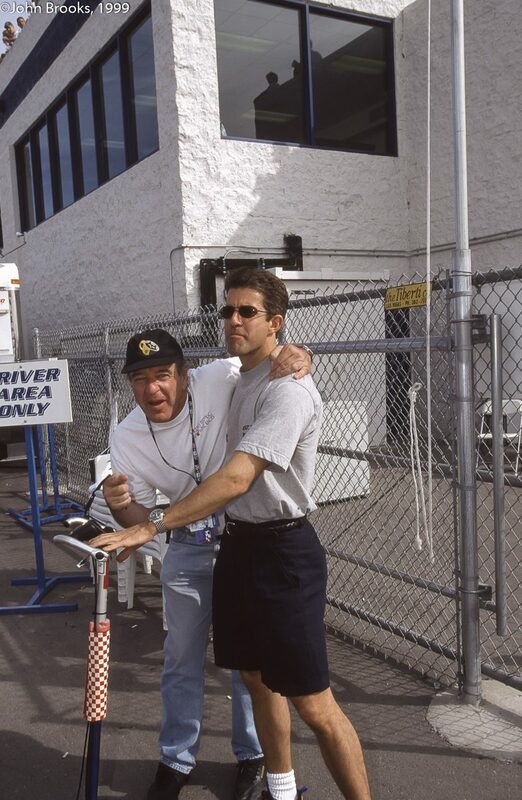 This was prior to them doing the Rolex 24 Hours of Daytona in February 2001. The Earnhardts had never driven in the Vettes before nor had they seen the track. I had already met Dale (Big E) and Dale Jr. the month before when the whole deal was announced. 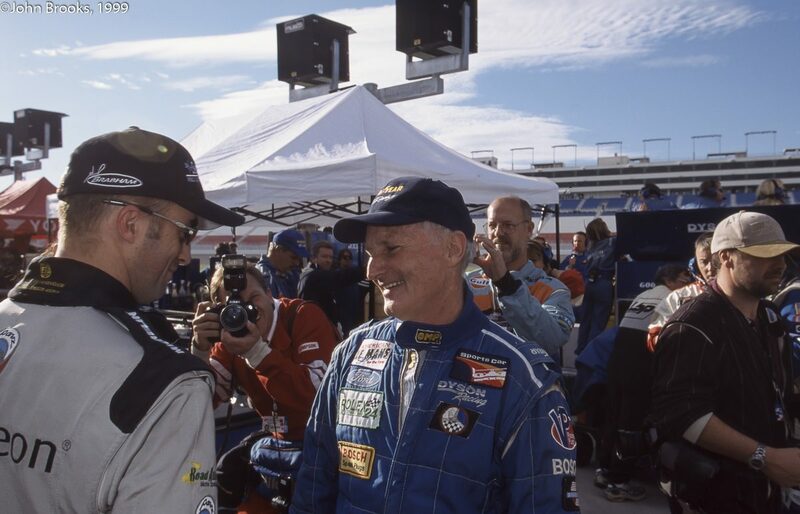 When Dale arrived at the track he grabbed me and asked me to take him around the track in my C5 street car, while Jr. went off with someone else. The street car Vette was the car that GM had given me to use during my time with the Corvette factory team. I had driven up in it from Boca Raton, about 125 miles south of Sebring. I did a couple of slow 70 mph laps of Sebring with Dale in the passenger’s seat. I pointed out the apex of each of the corners and how the weird Sebring pavement changes. Meanwhile Dale was filling me in on how his new boat was coming along. I wasn’t totally sure he’d heard one word I’d said, to be honest, but I kept babbling on as best I could giving my top Sebring tips in a two or three slow laps. As we came down the Ulmann Straight towards Sunset a third time, Dale piped up “My turn”. So I said “Alrighty, no problem,” and pulled in the pit lane and we changed seats. Dale asked if I was ready, suddenly I saw this little twinkle in his eye. I just knew this was not going to be good. Within a microsecond of the words “I’m ready”, coming out of my mouth Dale launched the car and we must have been doing 100 mph before exiting the pit lane. I closed my eyes, braced for the inevitable impact and started saying sorry for all the things I thought might affect my status in the hereafter. After a few seconds I realised we were not impacting anything and that Dale had masterfully negotiated Turn 1 and that we were already braking for Turn 3. Dale had not only been listening but had put down every apex and was gaining confidence with every corner and gear shift. As we were flying down the Sebring’s long back straight I was starting to relax, I could even think about getting out of the car and walking away, we were almost home, one more corner. But wouldn’t you know it, there was more. Dale flew into the braking zone at Turn 17, a monster of a brake zone in any car, never mind a production car with zero downforce. As Dale went for third gear from flat out in fourth the car felt like it got hit by a truck and ripped sideways into a massive spin at over 130mph. Round and round we went until finally coming to rest about 8 feet from the bridge at the apex of turn 17. I just sat in silence for a second and then looked at Dale. He had the biggest grin on his face. He looked at me and asked “You a nervous Nellie yet?” “Nope” I lied. He looked down at my feet and said. “Well that’s not what your feet are telling me” and he laughed. I laughed too, admittedly a more nervous laugh. He was right of course, my feet had almost pushed right through the fire wall as I braced myself. We calmly drove into the pits and parked. No one had really seen anything and nobody asked any questions, it was amazing. Of course the question on my mind was why had we spun out? I’m sure some of you car fans can hazard a guess. My own little thought on it would be a grab for 3rd gear ended in a grab for 1st. That would have certainly caused the immediate spin. Did we ever talk about it specifically, no? Am I sure Big E found 1st gear, pretty sure? Do I think he might have done it on purpose to bust my chops? From the mischievous look in his eyes after the spin, a distinct possibility ladies and gentlemen, a distinct possibility. That is my most cool Sebring moment for sure. It is a different story and feeling than winning the 12 Hours but I thought you might like a story a little off the racing line. 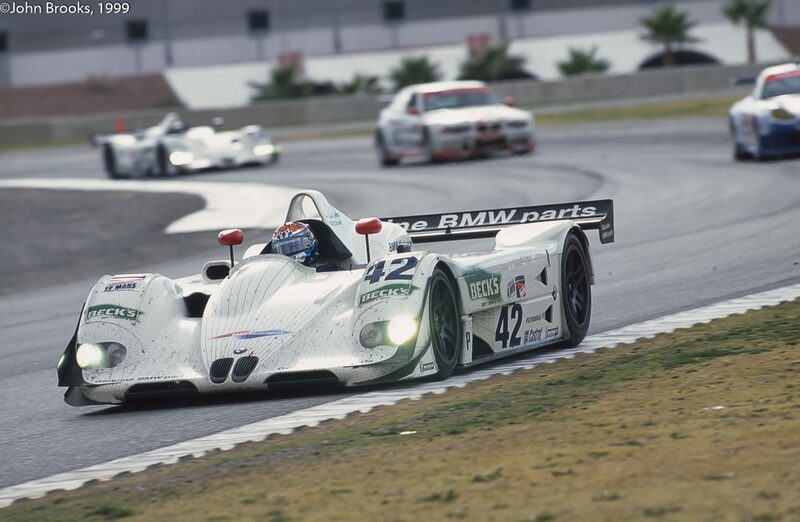 When friends in Europe ask me about Sebring, I refer to it as being a bit like Woodstock, but for sportscars. 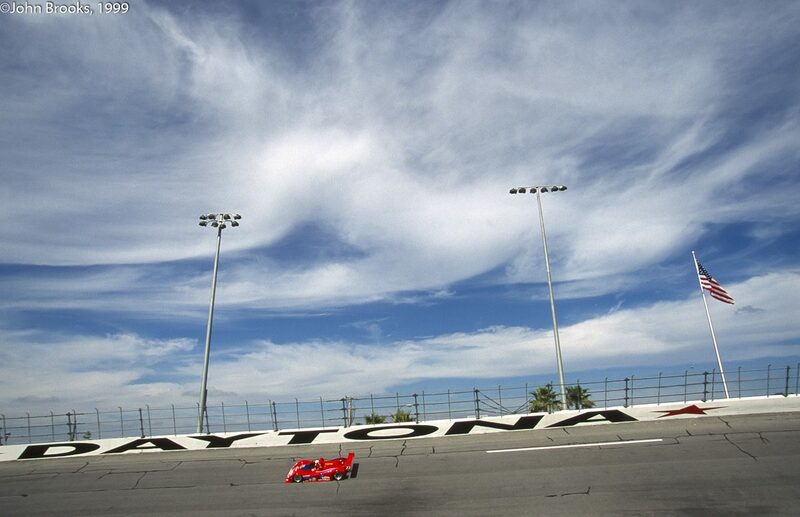 Coming from the sanitised world of European race tracks it is always a great joy to each year start the season in the relaxed and down-to-earth Floridian atmosphere. The guys running the Sebring event are just as professional as their counterparts across the pond, but that week in March they sure try to make everybody’s life as easy and enjoyable as possible, as do the fans. One afternoon after testing, early in the “Sebring week” in 2001, while standing on the pit lane terrace, our Corvette team photographer and I noticed a scantily clad lady tanning on the roof of one of the RVs, right in front of the Corvette pit. She was wearing little more than a postage stamp-size bikini and, obviously, drew some healthy attention from the Corvette crew (and indeed most other crews who had a view). As the week progressed, the girl got more daring, the bikinis got smaller and our crew got more and more enthused by the unexpected moral support from across the road. On Thursday morning before practice, a senior Corvette Racing team member donned his shades, hopped on a golf cart and made his way to the other side, armed with his usual convincing charm and a “Corvette Racing – Welcome Race Fans” banner which was neatly tied to the fence in front of the lady’s RV. When later the crew arrived to set up the pit for the practice session, they immediately noticed their new #1 fan and certain requests were hollered across the track. Soon enough, the lady fulfilled their wishes and off came the mini-skirt to give the boys a 360-degree view of a tiny professional g-string contraption which briefly silenced her fans all along pit road. The banner unfortunately disappeared the next day, and apparently the lady was arrested on Friday while strolling through the paddock in a short, fishnet dress and little else. Oh, and Sebring also has the best coffee trailer in the business, conveniently parked right outside the media centre. Helps cure the jet-lag. 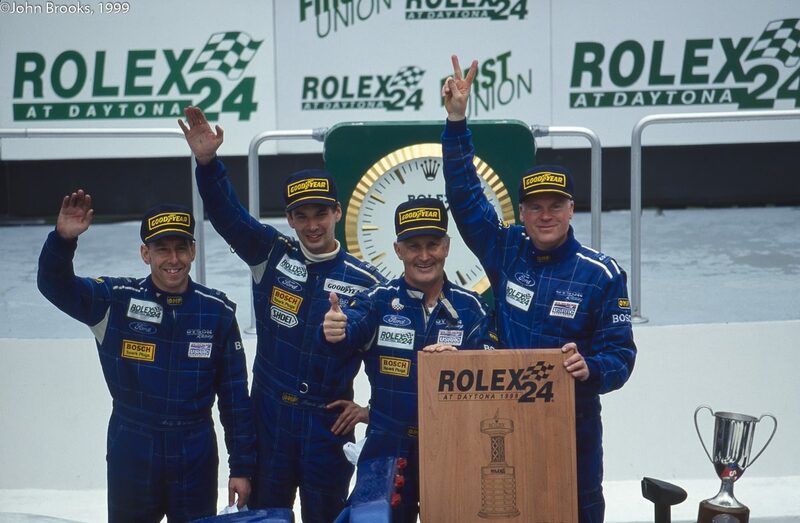 But what will be forever my best memory about Sebring, is the the podium of the 2001 race. The smile of Michele Alboreto, my co-driver, next to me. It was his last race and last victory before the terrible crash at Lausitzring. I was co-commentating with John Hindhaugh at Sebring in 2007 in the final stages of the race – John’s attention, correctly, was on the overall winner but I’d been watching the developing GT2 battle between Jaime Melo and Jorg Bergmeister – I got Hindy’s attention to what was going to be a grandstand finish just as the TV turned their attention to the Ferrari vs Porsche shenanigans. From that point on there was no point in saying a thing as Hindhaugh went into overdrive, gripping both sides of the sound desk and nailing it with an emotionally charged but perfect commentary on one of the epic finishes to a classic endurance race – I swear he didn’t take a breath – or pause – for a full two minutes. The film of that last lap became an internet classic of course and laid the foundations for one of the great needle matches in the ALMS – Risi vs Lizards, Ferrari vs Porsche, Melo vs Bergmeister. Mike Garton was a factory driver for British Motor Corporation (BMC) during the 60’s. He recalls the 1968 Sebring 12 Hours. It was March 1968 and I was with the BMC mob on our way to Florida. We tried to leave London Heathrow in a VC10 bound for New York but had to taxi back for few hours’ delay. We found out that a fuel pump actuator was changed – not a good omen ! The flight was then diverted to Canada as we ran short on fuel. So we had to spend the night in New York as we missed the connection, eventually arriving West Palm Beach the next day. We found Geoff Healey was not best pleased as the dockers had left the imprint of their size 12 boots all over the alloy bodywork of our Sprite Coupe. Before the cars could be released from US Customs they all had to be steam cleaned. Warwick, where our factory was based was subject to quarantine as that winter there was a major outbreak of Foot & Mouth disease that devastated the farming community. At Tech, the officials objected to my race gloves, they felt that the soft leather gloves with pin holes were unsafe. I was told that I must buy the official gloves, but on seeing them I pointed out they had larger holes than mine and said no thanks. Eventually they agreed with me and I kept my gloves. Then we finally got out on track, I was totally awed by the size of it all. However the pits were from the Dark Ages with fuel drums on scaffolding. I remember the Howmet TX Turbo especially, it caused much excitement. BMC had entered our Sprite prototype, a Group 4 Midget, Group 3 MGB and the MGC prototype. During practice I tried different cars while learning the circuit and trying not to get lost. 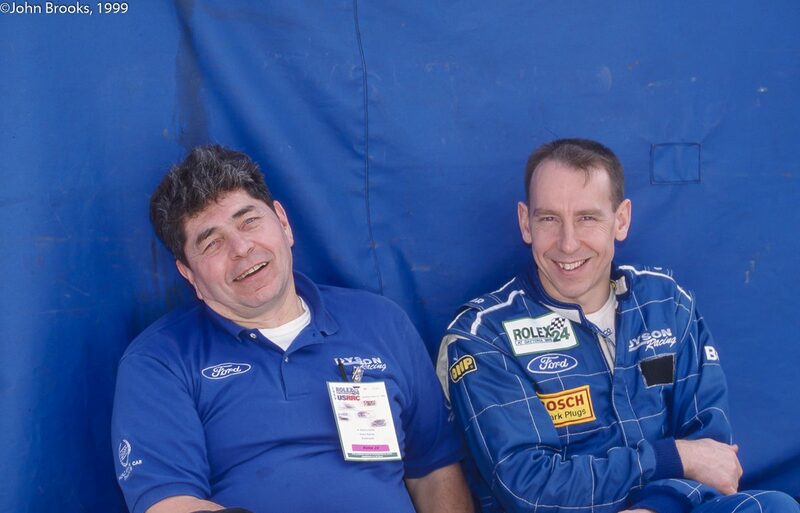 We had a good start by Clive Baker, my co-driver, who reappeared early in the race with overheating, we sent him back out again and promptly disappeared. He returned on foot reporting that the fuel is contaminated with water. Actually that’s not what he said, but I cannot repeat the exact expressions here! Clive was sent back to car with some tools accompanied by Geoff Johnson, the Lucas Fuel Injection boffin, to advise over the fence. After a while Clive got the car back to the pits and the boys cleaned out the system. We found that the fuel drum had over a gallon of water in it. Once that issue was fixed we found that our pace was good. But our fuel stops were interspersed by stops to top up the coolant as car was continually overheating. 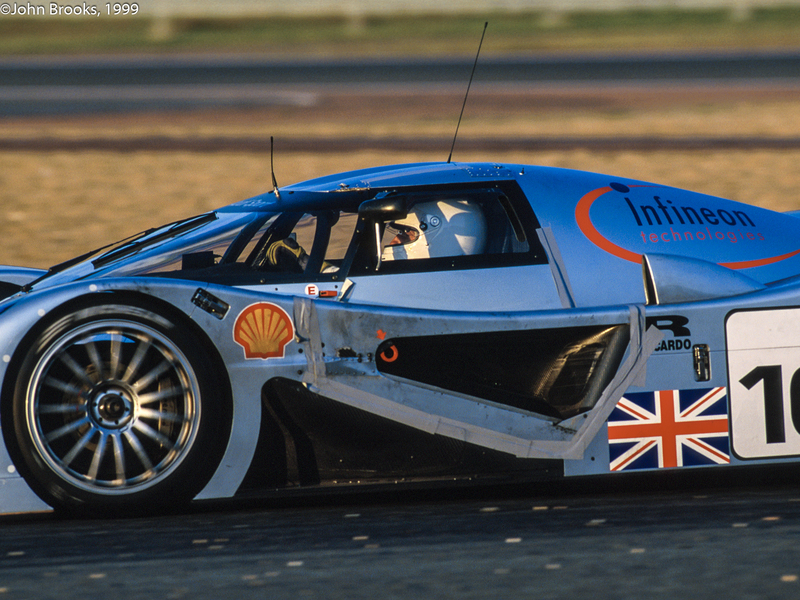 These extra calls into the pits were really annoying, considering how well the little 1.3 litre ‘A’ series ran. We managed around 120bhp with the experimental Lucas fuel injection, hitting 7400rpm continually on the straights. The car also had experimental four wheel brake discs which were fantastic. The only problem was the pedal disappearing on the straights due to the pads being knocked back, you learned to tap the pedal with your left foot so there was a hard pedal for the hairpin. On the last session of the race a Javelin tried to side swipe the Sprite and to miss him I had to leave the track at the hairpin, I hit the sand but kept foot down and just managed to get out and back on track. At the finish we were classified and we won the class! Funniest memory – Paul Hawkins, coming into pits with a badly damaged car, as a result of contact from a car that pulled across him, driven by a well known lady driver who favoured pink. As he got out of car a media guy shoved a microphone in his face and asked for a comment. As this was then broadcast over the track live he probably wished he hadn’t asked, as Paul replied in typical Aussie fashion. Oh dear. After the race was run I flew back to New York for the Motor Show and worked on the BMC stand where that wonderful ‘car’ the Austin America’ was introduced. I have now raced at Sebring three times, always with Peugeot. Although I finished on the podium in 2010, I think my favourite memory of the race comes from 2008. It was Peugeot’s first trip outside of Europe with the 908. We knew that Sebring has a reputation for testing the limits of the car and also the drivers. We needed to finish to learn about the car and gather information for the future. We were on the front row, with the #1 Audi on pole position but we felt that we had the faster car and were determined to prove it. I was nominated to start, so my team mates, Stéphane Sarrazin and Pedro Lamy discussed strategy with me. This happened while on the grid and I think they may have been joking, telling me to go round the Audi on outside on the first corner, a completely crazy risk with 12 hours of racing to go. It felt really great, I really loved it, why I went racing in the first place. We had a few problems in the race and did not keep the lead but we did finish. That move will stay with me forever, when someone says Sebring it is what I remember the most. John….I have so many fond memories of the Sebring 12 Hour events from the 20+ years that I was there as IMSA’s Race Director, and the history that it brings, it is really impossible to single out one….but there was one event that truly stands out in my mind and, I am sure, in the minds of a few other folks who worked in Race Control. The Race Control office was remodeled in the late 80’s or very early 90’s and was nicely done in that there was more room, better lighting, and an outside stairway that provided access. During the 12 Hour race, a power transformer that was located on a new power pole very close to the new outside stairway began releasing a significant amount hot, poisonous liquid of some sort. The order came from the Fire Department to immediately evacuate the Tower as this substance was really bad news (contained PCP’s or some other really ugly agent) and would eventually cause the transformer to blow up and cause significant damage to anything around it. Only problem with this order from the Fire Department was that this stuff was showering down on the only stairway to exit the facility. We all decided, the Race Control staff, we would stay the course and wait it out and continue running the race. About a half an hour later, that shower of liquid stopped and the Fire Department folks cleaned up the mess and all was well. Just kind of one of those things that sticks in your mind…..for a long time. 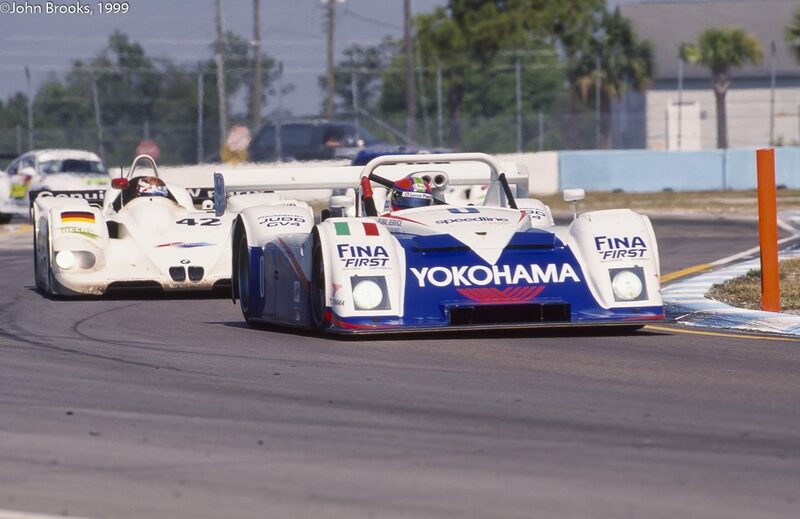 I have many memories of Sebring, good and bad, but that is only in terms of the racing. That usually tends to go by race results. From my point of view Sebring 2009 is probably one of my best races in my career, it was fighting all the way to the end against Peugeot. The last two hours I had to pull everything out of the bag to make sure that the R15 won its first ever race. I could also look back to 2006 and the pole position with the first diesel, the R10, and to give the car its first victory, with Tom, Dindo and I, it was really incredible. But the biggest impression Sebring has made on me is the crowd, the 180,000 or so fans that turn up. The way they create such a carnival, they make this an annual event. The way they get into the spirit of this unique race is just………..fantastic. there is no other way to put it. I do love that at the autograph session you see the weird and the wonderful; someone dressed as The Stig’s very fat brother, then there are the lawyers dressed up as cows, everyone coming along with their families and friends, all being part of this great event. As a single story, probably the biggest thing that has brought me into this scene was going to Turn Ten, for a photo shoot with Mr. Brooks, one year (2004). To see that there is a club at Turn Ten, where they have made their own grandstands, they have made their own bar, their own restaurant, in effect they have cornered a section of the track as their own territory. They return there every year, like a pilgrimage. They have their own entrance ticket effectively, which is a key ring and I am pleased to say I have been able to build up a collection of Turn Ten key rings over the years. To see the commitment that these guys have put into enjoying the 12 Hours of Sebring certainly matches the commitment that AudiSport and every other team makes to win the race, that makes Sebring special. I had been testing the Toyota TS010 in Eastern Creek, Australia a few weeks before (Sebring ’92). We had been doing a marathon test, which lasted for nine days straight! Eastern Creek is a great racetrack, but there is a monster bump in the middle of turn one, which is taken flat-out in sixth gear at about 190 mph. Fantastic corner, but each time you go over the bump you get bashed about quite badly in the cockpit. Well after nine days of endurance testing I went over the bump one more time and, CRACK, two ribs decided they’d had enough of that! Within an hour Hitoshi Ogawa had also broken his ribs for the same reason. As you can imagine, the flight back from Sydney to London was interesting… If I got up for a walk around the plane, I remember having to tell anyone who was thinking of passing me going the other way in the aisle, DON’T TOUCH ME, as you pass me. Sneezing was another very painful experience. Anyway, back to the point of the story; my ribs broke on February 29, 1992, and the race day at Sebring was on March 21, 1992. I didn’t dare tell Dan Gurney what had happened, as I knew he would find another driver. 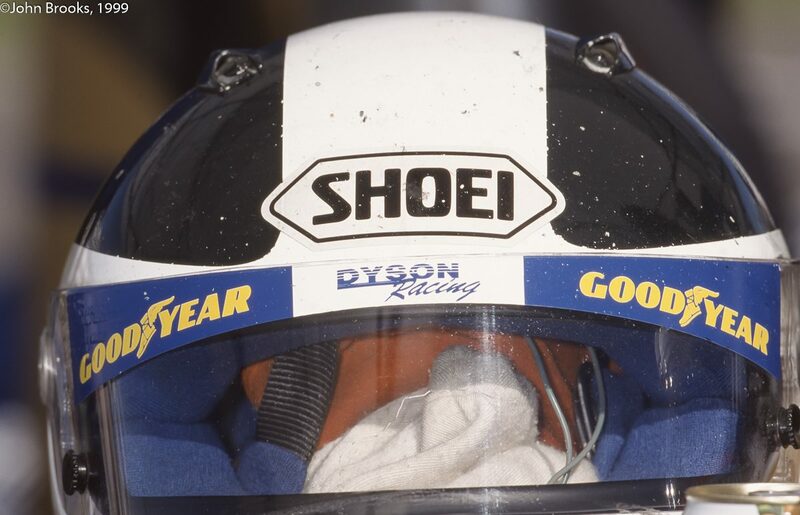 I remember the worst part for me was the driver changes and also, strangely enough, under yellow. Behind the pace car the stiffly sprung Toyota was running too slow to compress the springs and the car bounced all over the place – not pleasant. Anyway, we won! The 12 Hours of Sebring is one of the hardest races in my point of view, all over the world, for a driver and the team. I have competed in the race nine times between 2001 and 2011. 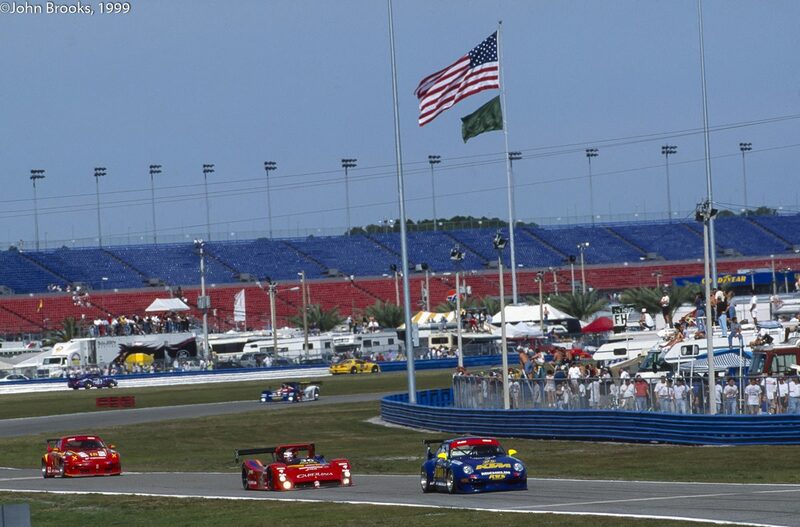 2001 Sebring was the first race for me in the US, that’s why Sebring has a special place already for me. With the Alex Job Racing Porsche we finished 2nd in GT, a great result. The heat, the roughness of the track, the humidity, the corner speed, the bumps, the track layout and all the traffic makes this race absolutely tough but also challenging. You want to beat it, to win it. 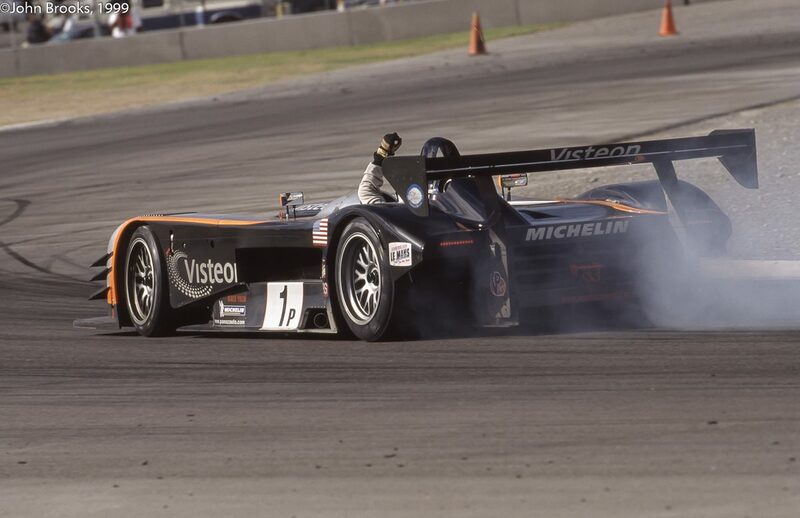 My best Sebring memory was the overall victory with the “small” LM P2 Porsche RS Spyder from Team Penske! It was a dream come true! We had a perfect race. The years before, Romain and I always had a difficult Sebring as not only a single race but also as a start to the American Le Mans Series. So it was vital to finish this race and to score the points. But also there was the glory to try to win it overall and be part of the “Heroes’ Wall” at the entrance of the paddock. In 08 everything came together! 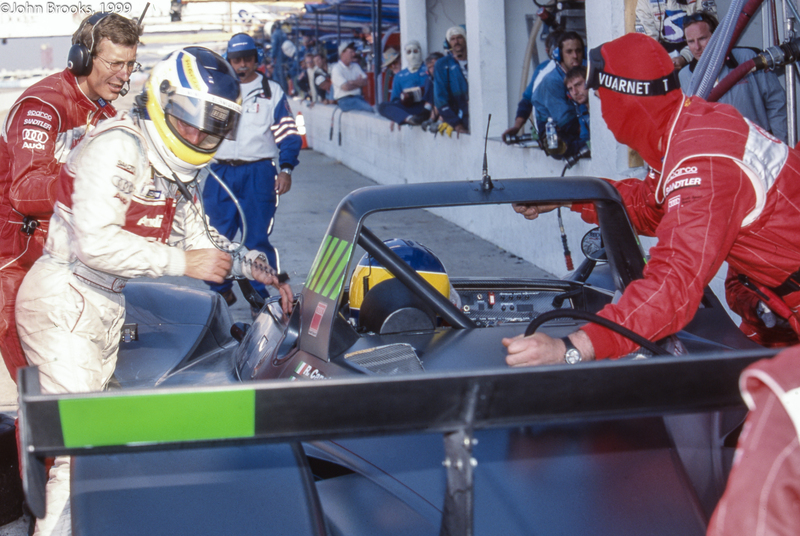 And also we made Roger Penske very proud, it was his first overall Sebring win as a team owner. 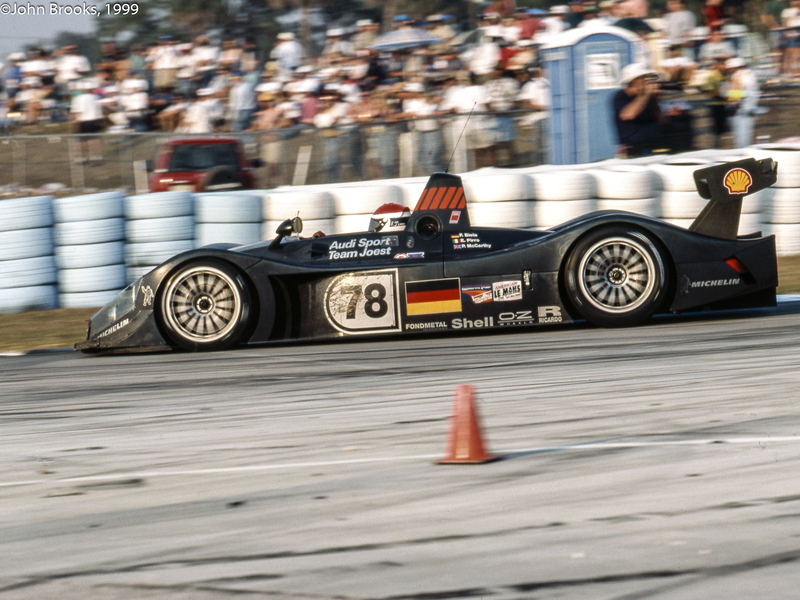 For Porsche it was the first overall Sebring victory since 1988. Between 1970 and 1980 I raced eight times on the old 5.2 mile Sebring circuit and there are two words that come to mind: hot and rough. In 1971 and 1972 when the race was still a part of the Manufacturer’s Championship Series the cars I drove, 2 liter and 2.5 liter Porsche 911s, were some of the slowest in the field, mixed in with Porsche 917s and Ferrari 512s. This meant I spent almost as much time looking in my rear view mirror as I did out the windshield. In 1973 when the race came under the auspices of IMSA and was limited to the GT and Touring classes I was one of the fastest and cared little about what was happening behind me. As is the case today the old circuit was a combination of concrete and asphalt. Although the concrete portions were referred to as “runways,” in fact they hadn’t been used for that purpose for many years. The actual runway planes used was adjacent to the section of track known as the North-South Runway, and you’d often look off to your left and see planes taking off and landing. When the airport was first built, the concrete had been laid in slabs, which required seams between each one. As a result you felt as if you were driving on a washboard. With wear and tear over the years and the effects of weather and general deterioration, the concrete had inevitably shifted; fallen, risen and broken up. Although track maintenance was carried out each year prior to the race, weeds scraped away and concrete chunks removed, parts were bound to degrade and break up during 12 hours, so unexpected surprises were to be expected. We’ll begin our lap of the old circuit at the start finish line, midway down pit straight where we’d probably shift into 4th gear. I may have hit 5th just before entering the very fast left-hand sweeping turn #1, bearing in mind this is some 40 years ago and my memory is not crystal clear. Depending on traffic, which is something I’ll repeat, you’d swing to the right just after pit out in order to make the widest arched turn possible, clipping the apex on the left and drifting out to the far right, close to the edge of the concrete surface. This was one of the fastest turns on the circuit and could be taken flat out…or not, depending on who you talked to. If you were unfortunate enough to run out of room and slide off the concrete, a weed-covered expanse awaited you. The ground was not somewhat sandy here, which insured an explosion of dirt resulted. If you were lucky, it was nothing but a spin. If you were unlucky you might collect an errant chunk of concrete, a rusted piece of rebar or some other nasty bit of busness. Between turn 1 and the fast left-hand turn 2 was a short straight. Still in top gear you’d fly through turn 2, then almost immediately brake and downshift for the ninety-degree left-hand turn 3. Immediately after the apex the road surface changed from concrete to asphalt. I believe that originally this was one of many service roads that crisscrossed this part of the airport. You immediately felt the smooth surface under your tires which was welcome each lap. From 3rd gear you’d shift up to 4th for the short run up to the Esses, then back to 3rd for the quick left, right, left flick under the MG Bridge. I seem to remember the track sort of undulating a bit through here. When taken properly it was a nice little section. Unfortunately, it was where my race ended in 1975. I believe I was running 2nd in a Porsche RSR in the latter stages when another RSR spun ahead of me, flew back across the track and I promptly T-boned it. I made it back to the pits on the front rims in a shower of sparks, but the front left wheel nut had been smashed onto the hub and the chassis was badly twisted, not the mention extensive body damage. After the Esses, it was up to 4th gear and into the long sweeping right-hand Big Bend and under the vehicle bridge. Depending on traffic, you either drifted out to the left or hugged the right side. In 1973, driving a Porsche RS with Milt Minter, I was on my first lap after taking over early in the race when, in the middle of this curve, the car suddenly burst into flames with a loud WOOOMPF. I later learned fuel had surged up the vent tube onto the left-front disc and ignited. I pulled to the side of the road, where thankfully emergency crews arrived quickly and extinguished the fire. I drove back to the pits where the crew cleaned up the car and we went on to finish 2nd. Who’d a thunk. I may have shifted to 5th on the exit to Big Bend, but the Hairpin was fast approaching. If you were on your own, it was a mechanical exercise of braking and downshifting, at least to 2nd gear and in some cases 1st, clipping the apex of the turn and accelerating away. All neat and easy. If you were in traffic, there was always the potential for disaster with faster and slower cars jockeying for position. If there was one place where body to body contact was insured numerous times during the race, it was the Hairpin. In the 1971, Gregg Young was driving a Ferrari 512M and overcooked it in the hairpin. There was an exit road to the left of the turn, but if you slid across it, as Gregg did, there was a large sand bank waiting. His car climbed the bank and flipped onto its roof, and since the doors on the Ferrari opened up, not out, he was trapped inside. Luckily the corner workers were on the scene quickly and a group of them lifted the car up just high enough for Gregg to crawl through the door. The second he was out, the car burst into flames. I recall a two-page spread in Sports Illustrated showing the corner workers dropping the car, Gregg scrambling away and the Ferrari, “fully involved,” as firemen say, behind them. The Hairpin was a place where many photographers congregated as they could get quite close to the track. Of course a bonus was that there was always the possibility of drama, as evidenced by Mr. Young’s conflagration. It was the one place on the circuit where I remember seeing familiar faces of photographers I knew. Sometimes I’d give a little wave if it was a close friend. In 1971, during night practice in my 911S I recall being followed closely by a set of lights through Green Park. On the exit I clung to the right as a car pulled alongside. Looking over I saw it was Jacky Ickx in the Ferrari 312P. He hesitated a moment, shook his fist and then blasted off into the distance. It was only my second FIA race, so I was somewhat mortified. The following year when I was making the documentary film, The Speed Merchants, I got to know Jacky quite well. 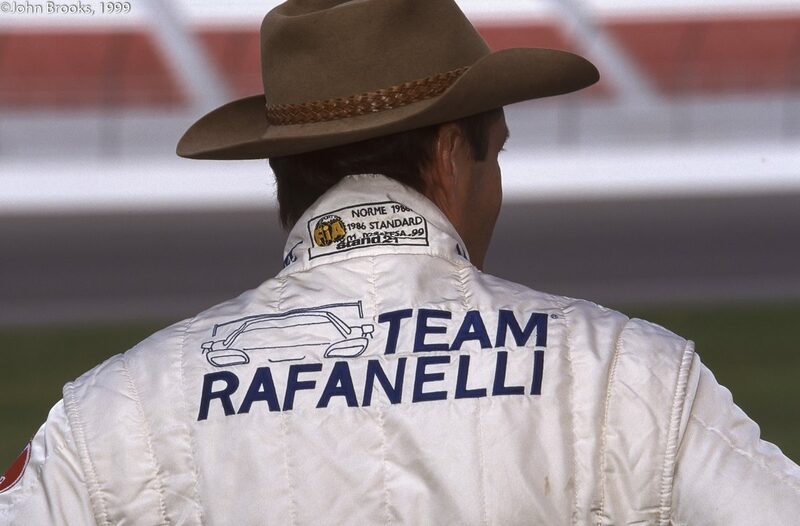 At dinner one night I related the story of his fist shaking at Sebring the previous year. “I would never have done that,” he said, with a guilty grin on his face. After Green Park there was a long section that may have been called the Warehouse Straight where you got up to 5th gear and the asphalt changed back to concrete. Fast approaching was a very quick right hand sweeper, taken flat, or close to it, after which you were all over your brakes and down shifting for the 3rd gear right hander that led onto the 4,700 ft. North-South Runway. This long section of the track was sort of like the Wild West, ie: anything goes. It was so wide that cars would often run three and four abreast. There was always the chance a car ahead of you running the same speed would throw up a piece of concrete, so you’d pick another lane. In the meantime you might be passing slower cars on one side and being passed by faster ones on the other. Some sections of the track were smoother than others, and you quickly learned where those were, sometimes drifting back and forth to weave around the rough bits. Maybe you’d look over and wave to a fellow driver you knew. At the end of the North-South Runway was a 90 degree turn that led onto the Backstretch, but because there was a wide expanse of concrete on both the entrance and exit you were able to take the turn at a very high speed, 4th gear or even 5th. To turn a fast qualifying time, swinging out wide to the left before turning into the apex and drifting out obscenely wide to the left on exit was a prerequisite. If you were going to perform this maneuver you were forewarned to keep an eye out for another car diving on your inside otherwise there could be a nasty incident. The Backstretch was smoother than the North-South Runway and not quite as long or wide. At the end was the double-apex left hander that has changed little from its present configuration. If you were going into the pits, you clung to the inside right, and if you were continuing for another lap you’d swing out to the left and climb through the gears back to the start/finish line. Since its inception in 1952, Sebring has always been a unique venue in which to hold a race. The lack of decent accommodations near the track in the 1970s was always a challenge and I did my time at The Kennelworth and Harder Hall, the pink stucco whales from the 1920s near the town. There were fairly massive crowds during this time, with spring break providing its fair share of college fans. Much like today, they were probably there more for the party than the racing, but in the 70s things were considerably wilder than today, if that’s possible. At one race I remember driving through the infield with some friends between stints to check out the “zoo” as we called it. It was a radical juxtaposition. To be sweltering in the hot noisy car, racing around the circuit one minute, and idling through the infield the next with the air conditioner blasting, the smell of pot wafting through the air and young ladies flashing their wares. This entry was posted in Nostalgia, Notes from the Cellar, Race Reflections, Real Men and tagged Allan McNish, Andy Pilgrim, Andy Wallace, dale Earnhardt Snr., Graham Goodwin, Ken Breslauer, Marty Kaufman, Michael Keyser, Mike Garton, Nic Minassian, Sebring, Serge Vanbockryck, Timo Bernhard on March 24, 2012 by John Brooks.